Whether you’re shopping dance costumes for competition, a Christmas show, spring concert or recital, there are a ton of reliable, fabulous costume companies to choose from. In no particular order, here are Dance Informa’s 13 favorite dance costumes this season. ‘Cosmic’ from Tenth House, Designed by Allison Holker. Photo courtesy of Tenth House. This ballroom-inspired costume, designed by Allison Holker, has everything you could possibly want in a costume — sequins, fringe and a beautiful neckline. Included with the costume are rhinestone hair clips and a sequin armband. This stunning grey costume has sequined appliques that complete the look of a girl floating in the clouds. I especially love the top with mesh straps and the asymmetrical skirt that is sure to float on stage beautifully. If you’re thinking, “I need a really shiny gold costume for this musical theatre production”, A Wish Come True has a perfect costume for you! Available in 12 different sizes, you can create a sparkly fun piece with a wide variety of ages involved. Included with this costume are a sequin bow and hair barrette. This adorable costume is perfect for a little princess. It’s truly “Sugar and Spice”, and everything nice! There is a flower and tricot barrette included with this costume. “Neon Lights” is such a vivacious and vibrant costume for any dancer to feel super confident in when on stage. These neon colors will shine under the lights during an upbeat jazz, tap or musical theatre number. This costume includes a jeweled feather patch for your hair! ‘The Dream’ from Victoria Dancewear. Photo courtesy of Victoria Dancewear. This leotard with attached tutu truly is a “dream” ballet costume. The brown and teal colors work well together to create a kind of ombre effect on the skirt. Included with this costume is a floral wreath headpiece. This “warrior” character costume is fun and yet strong at the same time. With a cool-patterned skirt, and arm bands included, I wouldn’t want to mess with any girl wearing this tribal costume. Give me a playful full skirt with sassy polka dots any day! What I love about this skirt from Eurotard is that you can dress it up with a shiny top, or keep it simple with a black leotard. This is a popular skirt for Spanish dances and The Nutcracker. Velvet is back! This costume is made from a glitter stretch velvet fabric, and the color pops so well. A ton of accessories come with this costume, including a tiara on comb, arm ruffles and choker, all wrapped and sent on a hanger in a garment bag. This girly, yet strong hip hop costume is perfect for the fierce competitor, or an awesome hip hop routine for recital! Great on all shapes, the stretch fabric can move well and is not too form-fitting. ‘Rumor’ from Costume Gallery. Photo courtesy of Costume Gallery. 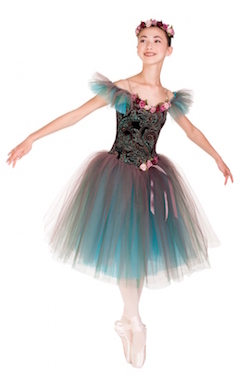 Available in three colors, this fun costume has sparkles and a circular skirt, which will move beautifully on stage. I can definitely see a fun jazz number with this costume! Included with the costume is a glitter stretch headband. I absolutely adore the color and style of this costume. I feel this would be a perfect “first lyrical piece” costume for any young dancer. With adjustable straps, it is sure to fit well with all shapes and ages. Included with this costume is a light green tulle pouf hair clip with a rhinestone butterfly attached. I want this sweatshirt just to wear everywhere, especially during a cool hip hop number. Simple, yet awesome, this swagged out new costume brand is sure to please dancers and audiences. 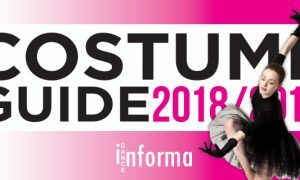 To see more spectacular costumes from all of these companies, visit Dance Informa’s Costume Guide here. Photo (top): “Star Studded” from NX3. Photo courtesy of NX3. Win 1 of 10 tickets to the Capezio Dance Awards! Tessandra Chavez wins an Emmy!